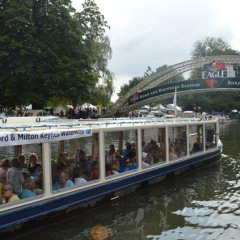 The John Bunyan, Bedford’s Community Boat, offers cruises on the River Great Ouse in Bedford to suit all age groups. We can offer schools, colleges and youth groups a variety of cruises in a unique education friendly environment. A cruise provides the opportunity for teachers to integrate a lesson plan based around such topics as nature, the environment, history, geography, commerce, waterways, transportation and others into a real-world experience. For the younger children, it can be a gentle introduction to boats, rivers and the local wildlife. We are able to accommodate a third party ‘education provider’ if required. You may also like to consider combining a visit to other local venues with your cruise. The boat can even be a potential venue for school staff Away Days. 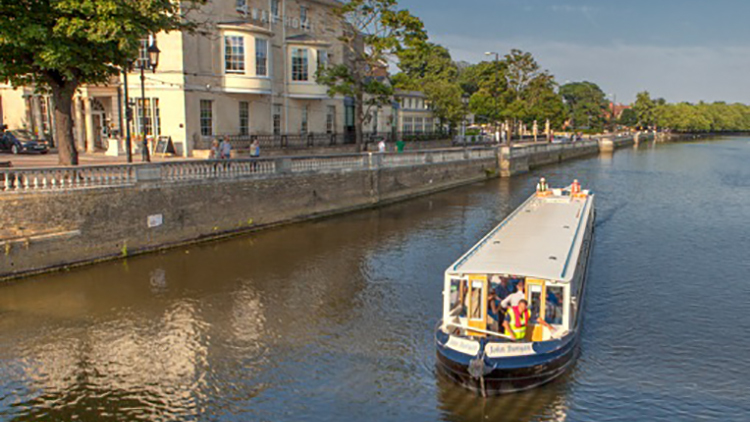 The John Bunyan offers a number of standard cruises departing from and returning to Priory Marina. We also regularly use the moorings at Engineers Footbridge (near Mill Meadow), Swan steps (junction of Newnham Road & The Embankment) and Sovereigns Quay (adjacent to County Bridge) should you wish to consider using one of these as an alternative. We would be pleased to discuss cruise itineraries to meet your requirements. The John Bunyan boat can accommodate up to 50 guests, which includes all students, teachers, assistants and speakers. Where a group is larger than this we can offer a “Split Cruise”. If you have more than one class on your planned trip, this arrangement potentially eliminates the need to book two cruises. Typically, we would suggest splitting your party into two groups (both with up to a maximum of 50 guests): the first boarding the boat at Priory Marina and the second boarding the boat at Sovereigns Quay. We would cruise one group upstream for 45 minutes, and swap over at Sovereigns Quay, with the second group cruising downstream to finish at Priory Marina. Both groups will experience the same part of the river and go through Town Lock and under Town Bridge. This can be achieved in a 2 hour booking and can be repeated again in a longer booking as necessary, proving very cost effective for schools. For further information our ‘Cruise & Learn’ brochure and the ‘Cruise Extras’ insert can be found here. Should you wish to pick up only from Newnham steps, an extra charge of £37.00 is applicable. From Sovereigns Quay an addition charge for £56.00 is applicable. These charges are based upon the boat running empty from Priory Marina. Accessibility: We have a disability access lift and large toilet suitable for passengers who have disabilities.